On Friday 15 March, the second Youth Strike for Climate took part in Oxford City Centre, as part of a global movement of children, young people and their supporters. Researchers from across Oxford University staffed an information stall offering to answer questions about climate science and responses to climate change. We made a record of the questions asked on the day, and received subsequently via email and social media, and here are some of the questions and answers we came up with. We were asked a huge range of questions, from detailed issues of climate science to questions about we can change society. We have sorted the questions into categories. Some have been answered by more than one researcher – particularly those where many different types of knowledge are needed to give a complete answer, or different answers are possible. Some questions have not yet been answered, we will keep adding to the answers over the coming days and weeks. 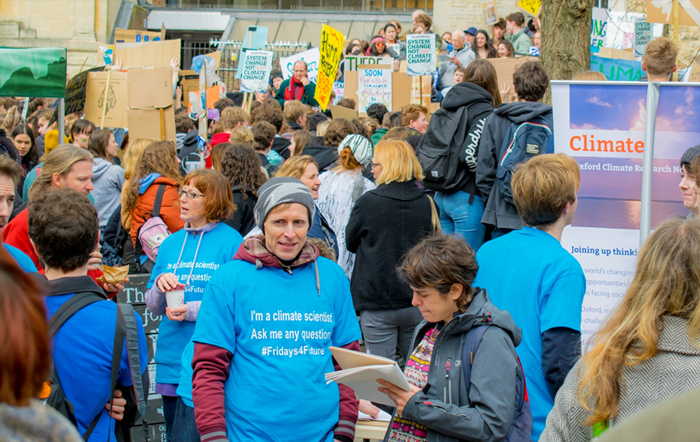 Other universities and scientists are also answering questions from young people who were at Climate Strike events across the UK – for example, Leeds University climate scientist Chris Smith answered some climate change questions from teenagers. Climate change is a large-scale, long-term shift in the planet's weather patterns and average temperatures. There are several good web sites which explain the basic science of climate change, as well the causes and the impacts of climate change. Is the climate really changing? How do I persuade somebody it isn’t El Nino which is causing climate change? What about chemtrails? ‘Chemtrails’ refers to a myth that planes are spraying toxins into the atmosphere. There is no evidence that this is true. Along with other conspiracy theories, the chemtrails myth is debunked in ‘How it Works’ magazine, issue 108. For more information about other common myths or false arguments about climate change, and the evidence that disproves them, see www.skepticalscience.com. El Niño refers to natural warming of the tropical Pacific Ocean. It’s part of a cycle called the El Niño Southern Oscillation (ENSO) which has been happening for thousands of years and which also includes La Niña, which results in cooling of the tropical Pacific. On average, El Niño tends to cause warmer temperatures and La Niña tends to cause cooler temperatures. ENSO is one of the most important features of Earth’s climate and affects weather patterns around the world, but it is not the cause of global warming. This is shown by the fact that if you remove the effects caused by ENSO from recent temperature records, global warming is still there. The ENSO cycle is an example of what scientists call ‘internal variability’ – over periods of a few years ENSO does affect temperature, but the amount of warming and cooling brought by El Niño and La Niña evens out because both are just moving heat energy around – no heat energy is added to the climate system by internal factors. That would be like arguing that the water in a bath heats itself, rather than being warmed by an external heat source (a boiler). Climate change is likely to affect the ENSO system and change its impacts across the world, but exactly how is still a question scientists are trying to answer. For a more comprehensive description you can read the Met Office's overview of El Niño, La Niña and the Southern Oscillation and Evidently Scientifical's 'ENSO in a nutshell'. How fast is climate change going to happen? Climate change is already happening, and fast – the last 5 years were the 5 hottest years on record around the world, and Arctic sea ice reached its lowest recorded point in 2012. Since the late 1970s the rate of global warming increased significantly, and is currently between 0.15-0.2°C per decade. At this rate of warming, we could pass 1.5°C by 2030, when our aim is to keep temperatures below that by 2100. Other resources on this topic include the IPCC summary for policy makers and watch an animation of global temperature anomalies over the last 120 years on the NASA Earth Observatory website. When will climate change be stopped? This question was asked by a young child. I found it very moving. I don’t have a good answer – it would be easy to say the climate is always changing – but I think questioner meant ‘when will the climate go back to how it was before human activities changed it?’ I’m not sure it ever will. A better answer was given by one of our students, who said that the more people protest, and take action, and demand change, the sooner (further) climate change can be stopped. What is the contribution of methane and animal food production to climate change? How accurate is the ‘Cowspiracy’ documentary (claimed 50% of climate change produced by animal farming)? Currently it is estimated that livestock contributes 14.5% of human-made GHG emissions. Carbon sequestration has been posited by pro-livestock stakeholders to offset these emissions, but the evidence is that this potential is limited, and very dependent on circumstance (www.foodsource.org.uk). In terms of overall contributions of the food system to GHG emissions, it is estimated that between 25-30% of GHG emissions are related to the way how we feed ourselves – so this includes transporting, storing, preparing and cooking food, as well as growing it. How quickly would the earth recover if we stopped emitting all greenhouse gases today? Humans have been putting greenhouse gases into the atmosphere and warming the planet for over 100 years now. Because those gases stay there for a long time, climate change would continue even if we cut all greenhouse gas emissions to zero today – the gases we have already emitted would still be there causing the climate to change. If we stopped now, the Earth would most likely continue to warm for another 40 or so years before reaching a stable point about 0.6°C warmer than average. To keep warming to below 1.5°C below average (an ambitious target of the Paris Agreement), we would need to stop emitting by the middle of the 21st century. If you'd like to read more there is Professor of Climate and Space Science, Richard Rood's answer to this question on The Conversation and an explanation of 'Climate Change: The 40 Year Delay Between Cause and Effect' on Skeptical Science. If the absorptive potential of CO2 doesn’t change with increased concentration, why does it cause the planet to heat up? Carbon dioxide (CO2) is the most abundant greenhouse gas. It warms the atmosphere by absorbing heat from Earth’s surface and preventing it from escaping into space (the greenhouse effect). While it is true that increasing the concentration of CO2 in the atmosphere (as humans are doing) doesn’t change its chemical properties, including what wavelengths it absorbs, it does increase the range of wavelengths absorbed. Therefore, the planet heats up because the CO2 can trap more heat in the atmosphere if it is at a greater concentration. FutureLearn has a few climate related courses (free!) but needs more. Can you make a free online climate science course? We are planning to make more climate related material for the general public available on the web, although not as a FutureLearn course. Sign up to the ECI mailing list, to recieve monthly updates on our research and resources. In the meantime – you might like to have a look at our Climateprediction.net website – the world’s largest climate modelling experiment for the 21st century. The Open University offers a free course on climate change. Are there climate modules for school children KS1/2/3/4? A variety of organisations offer some climate teaching resources for children of various ages, and information aimed directly at children and young people. Please note, we have not read all the material on these websites – so can’t guarantee how accurate or useful it is. Campaigncc contains links to tlots of educational resources, however it a little dated. What subjects should my daughter study to be a climate scientist? The most relevant subjects are physics, maths and geography. However, many of our climate scientists didn’t study all of these for their A levels, and have learnt what they need at university or through workplace training. Climate change is the biggest problem we face, and everyone has something to contribute to it. As well as understanding the science, we need to understand how people can respond and act, and how to communicate the problem better. No matter what subjects you do at school, if you’re interested in climate change, you’ll find something to say about it through the lens of those subjects. Not everyone studying climate change is a scientist! Can I join the Oxford Climate Network? The Oxford Climate Research Network is an internal network of more than 170 Oxford University scientists focused on the challenge of managing climate change in a complex and uncertain world. Watch our short film, introducing the network. You can find out more about our research activity at www.climate.ox.ac.uk. Whilst the network is for senior Oxford researchers and academics only - it does not produce newsletters and can’t be joined by those outside the research community - there are many talks at Oxford about climate and other environmental issues, most of which are open to the public. What green student initiatives are there at Oxford University? In March 2019 Oxford students were clearing plastic garbage from Aldebra Atoll in the Indian Ocean, home to the world’s largest group of giant tortoises. Just one of many initiatives for dark blue students keen on being green - from joining the world’s largest climate modelling experiment, going veggie in November to teaching local school pupils. Many initiatives are student-led but others are organised by, for example, the Environmental Change Institute and the Environmental Sustainability Team at Estate Services. Some are very new but others are “ancient” – like the Exploration Club founded in 1927! Below is a short selection from the dynamic array of “planet savers” that Oxford students are constantly creating. If you know of any others, let us know please! Anthroposphere is a new interdisciplinary print magazine founded at Oxford University and open to students from around the world. We cover climate change and the environment through the lenses of natural science, economics, policy, politics, literature, pop culture, and much more. The world’s largest climate modelling experiment, climateprediction.net is a volunteer “citizen science” computing, climate modelling project. Over 350k people from 150+ countries have participated, including many students . The project runs climate models on people’s home computers to help answer questions about how climate change is affecting our world, now and in the future. Organise free, weekly events with world-leading speakers on the biggest issues in climate science, politics, economics, campaigning and more. Organise The Oxford School of Climate Change, an eight-week seminar series designed for all those who care deeply about preventing climate breakdown and finding answers to the most pressing questions in climate policy and science. Organise our Student Research Showcase, where students from all disciplines and academic stages can exhibit or speak about an environmental project that they have been involved with, followed by a drinks reception in our exhibition space. Campaign for concrete action to reduce the University’s contribution to climate change, including through the University’s Carbon Innovation Programme. Publish Anthroposphere biannually. Primarily act to organise events relevant to the matters surrounding energy and climate change. As the only student society in Oxford dedicated to all energy areas, we endeavour to provide a platform for all points of view with the aim of stimulating discussion and broadening knowledge. We run many activities throughout the year including site visits, sponsors events, workshops and our popular weekly talks. Our talks have featured a range of speakers from academics, journalists, industry experts and CEOs of top energy companies. These talks are held every Wednesday during term time and are followed by drinks and nibbles with the speaker. Expeditions vary from biological research to pure adventure: discovering new species of amphibians in the Andes, monitoring marine parks in the Moluccas, climbing unclimbed peaks in Greenland, and recording folk music in Tibet. The Club aims to help improve knowledge of our world through overseas exploration, as well as running a programme of talks and workshops during termtime to inspire and help with expedition planning. As a collaboration of seven higher education institutions, the Oxford-created IFSTAL is a pioneering learning community and resource to enable a step change in food systems thinking. We have already built a large and diverse community of over 1,200 food systems thinkers, including students from a wide range of backgrounds, alumni and workplace practitioners. IFSTAL is available (free) to all postgraduate students enrolled at the participating institutions. The programme equips participants with the skills to apply critical interdisciplinary systems thinking to issues of long-term food security through fostering intra- and inter-institution activities, and the means for taking new learning to the work-place. We are a student-run society offering talks, screenings and outdoor events on a wide range of current and contentious conservation issues, given by distinguished speakers from the University of Oxford and beyond. We aim to provide a space for environmentally concerned people to learn about current issues in conservation, and a forum for discussion about future conservation solutions. We also aim to engage in practical conservation work where possible, as well as providing members with information about volunteering and job opportunities in the conservation sector. NHBE Oxford is part of a new international group for graduate students and early-career researchers. It explores the nexus of nature, health and built environment. Other partners include Cambridge, Harvard, MIT, Stanford and Yale. It is open to all disciplines, including ecologists, geographers, architects, engineers, medics, psychologists and those in public health. The group hosts lectures, seminars, networking events and socials. A student-led campaign founded on the conviction that our educational institution must use its enormous financial and cultural clout for environmental justice in a changing climate. We are part of the fast-growing, international Fossil Free movement, which works to cut support of the fossil fuel industry in major institutions. We ultimately see divestment from fossil fuels as a necessary, politically significant step in the transition to a zero-carbon economy. OCJC is an official campaign of the Oxford University Student Union. We are a student-run organisation which provides pro bono research and consultancy services to development organisations around the world. Having been rebranded from the Oxford Microfinance Initiative in 2018, ODC now looks at other developmental agendas such as green social enterprises as well as microfinance institutions and banks. Oxford Networks for the Environment (ONE) mobilises the University's relevant expertise in science, technology, business and society. It has a weekly mailing to promote research seminars and talks across the University. It also promotes the work of several hundred researchers active in the environment and energy sectors. People & Planet is the largest student network in the UK campaigning for social and environmental justice. Our mission is to build an empowered generation of change-makers who are equipped with life-long skills, motivation and networks to be a force for change in achieving a more equitable and sustainable world. People & Planet has four current campaigns: Fossil Free, Sweatshop Free, Undoing Borders and Divest Barclays, and we run two projects: the Economic Justice Project and the University League. The organisation has headquarters in Oxford. ECI works with the Careers Service to offer sustainability internships with a wide variety of local, national and international organisations. Internships can run from 1 to 3 months. Teach Green student volunteers deliver interactive environmental education sessions to local young people in Oxford. We believe education is key to tackling climate change, so we are working to empower young people with the skills and knowledge to make a real difference through fun, hands-on activity sessions with local children! TBL is a 3-day course which helps Oxford students engage with current sustainability thinking and practice. In 2018 sixty students from more than 20 courses - from archaeology to zoology - heard from external speakers from business, government and the voluntary sector. Veggie Pledge is an annual campaign each November, co-ordinated by the Student Union and Oxford colleges. Students submit pledges to help their college become the veggie victors. Do you do anything to support or research veganism? A number of projects at ECI research changes in consumer behaviour around meat eating. A good resource on the discussion on food and climate change is the Food and Climate Research Network (FCRN) and its Food Source section. What can we do? / What can we do to meet the 12 year target*? / What should we be doing as individuals? Encourage others to do all the above! The ’12 year target’ comes from the Intergovernmental Panel on Climate Change (IPCC) Special Report on a Global Warming of 1.5°C which Myles Allen co-authored. “What about “We have only 12 years to act”? Emission scenarios that have a better-than-even chance of limiting warming to 1.5 degrees Celsius without resorting to massive—and potentially unfeasible—levels of carbon dioxide removal involve something like a halving of global emissions by 2030. However unlikely it sounds, this appears to be a relatively robust result (meaning that all available evidence agrees)." However Myles thinks that the focus on 12 years can be misleading. For more details, read his blog on the Green New Deal. Re-introduce the target for all new homes to be zero carbon that was scrapped four years ago. Re-introduce some of the subsidies for renewable energy that have been progressively phased out over the last few years, e.g. for community solar. Stronger protection for semi-natural habitats (woodland, wetland, grassland, heath) in the national planning policy framework. These store a lot of carbon in soil and vegetation but even ancient woodlands can be destroyed if there are ‘wholly exceptional reasons’, e.g. ‘infrastructure projects (including nationally significant infrastructure projects, orders under the Transport and Works Act and hybrid bills), where the public benefit would clearly outweigh the loss or deterioration of habitat’. Why don’t politicians do something? Do they not understand the science? Many have other priorities that they see as more immediate (housing, jobs). This is what their constituents will lobby them on most often. They have been conditioned to see economic growth (based on a conventional measure of GDP) as the answer to all problems, and the environment as a potential constraint on growth or a ‘nice to have’ extra when these other priorities have been addressed. They don’t understand (or don’t want to understand) that the long term impacts of climate change will eventually threaten all these other societal goals, and that well-designed climate action can actually bring huge benefits for health, society and the economy (e.g. by cutting air pollution). There has been lobbying over many years from carbon-intensive businesses and others, e.g. some developers lobbied against the introduction of the zero-carbon homes requirement, claiming that this would slow down the building of more homes to meet the housing crisis. Independent researcher Rebecca Willis has done some really interesting research on how UK politicians understand and respond to climate change. Her study found that, whilst most politicians understand the need for action on climate change, it is not straightforward for them to make the case for it. There are three main reasons for this. First, climate change is seen as an ‘outsider’ issue, not something discussed as part of the political mainstream of politics. Second, politicians feel under very little pressure to act on climate change. They report limited interest from their constituents, and need to find ways to make climate action relevant to the daily lives and concerns of the electorate. Third, there are practical, procedural and even psychological difficulties in responding to climate change, as large scale, long term challenges do not fit well with the daily practice of politics. How do we get politicians to put in the right legislation? / How should we best influence politicians? Start a petition on the partliament site – if your petition reaches 10,000 signatures it will get a formal response from government and if it reaches 100,000 signatures it will be considered for debate in Parliament. To be most effective a petition should call for a specific action that is within the government’s power to change. Respond to local authority consultations – for example the Oxfordshire Plan to 2050 is out for consultation until the 25 March. Talk to other people about climate change.